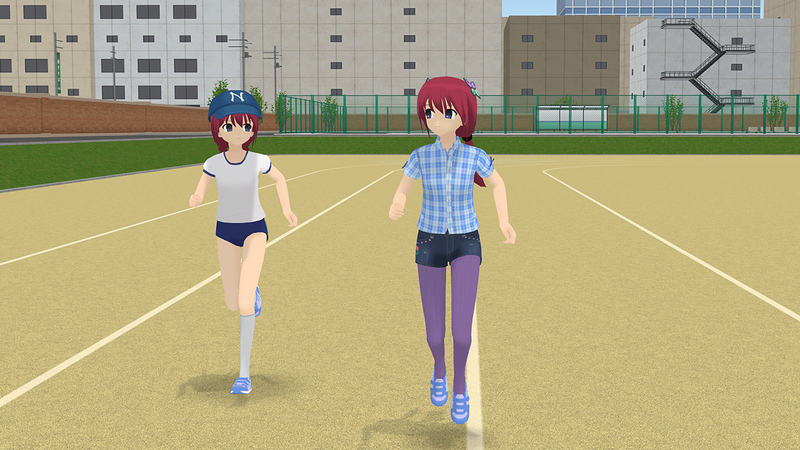 One new NPC in the school map: a girl running in the sports field. After completing the field track ten times, she will buy a drink and go towards map exit point. Two new uwabaki shoes (in the clothes store). New guardian statues of stone squirrels in the Shinto shrine map. Improved textures and UV maps for all tights and socks (better shadows and seams). New snacks: yakisoba pan (Taiyaki shop and Summer Town takoyaki stall), choco nuts ice cream, azuki ice-cream (vending machines). Schoolgirl NPCs now can actually buy and consume drinks and snacks in shops. In the Shinto shrine map, when all NPCs return to the bus, it will depart and ride away. Fixed a bug with tomato kissing simulation not starting in some cases. Rotation speed during walking is slightly increased. Fixed a water gun aiming issue (when used in “tank controls” mode). I’m experimenting with a few new features. One of them is tennis mini-game. But there is no guarantee as yet that it will appear in next update. No. It’s only for PC and mobile devices. Maybe, and maybe not. It will depend on whether I can come up with some interesting mechanics for a basketball game. So that both player and girlfriend can compete in it in some way, gain scores, and it will affect their skills/relationships. Right now I’m not sure as yet how to fit all of that into basketball activity. But I’ll think about it.